NEW YORK—John Murdock, a balloon artist, struggled to make his giant Godzilla balloon sit upright on a bush in Washington Square Park. There was a squeak. And then an eek. Finally, the tail went deep enough into the plant so that the monster could maintain its balance. It was a warm and moderately windy day. The breeze carried the sound of giggling children through the park, as two hollow Red Bull cans rolled away from Murdock’s backpack on the ground. “Why does Godzilla have blue eyes?” A child stopped and pointed to the sky blue balloon that peeped from Godzilla’s head. “He has contacts,” Murdock said. Murdock, nearing 40, is a bearded man with shaggy brown curls. 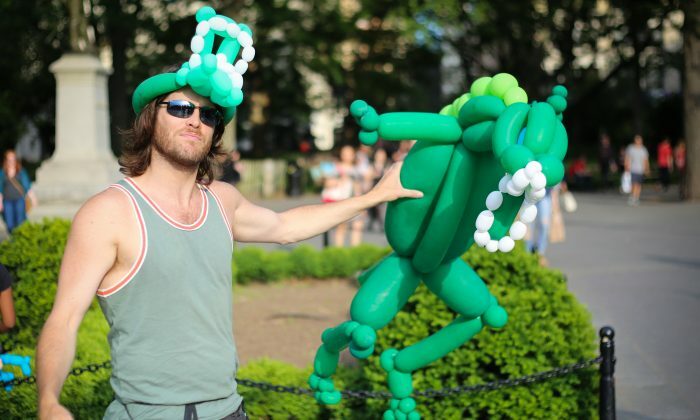 An alligator balloon hat rested on his head, matching his black jeans and green ribbed tank top. His blue eyes were hidden by dark Ray-Bans. He sort of looked like a vagabond. But he has a degree in international relations with a focus on conflict mediation. He chose to make balloons for a living so that he could be his own boss and freely speak his mind all day. He spurs philosophical discussions with passersby. Murdock’s heroes are Mahatma Gandhi and Winston Churchill, although, he noted, the two were mortal enemies. His salary is decided by the kindness of strangers. Whatever they want to pay, he said. The largest bill he has gotten was a hundred. Sometimes, he gives away balloons for free. He lives in a sublet in the East Village. He performs stand up comedy from time to time. He used to have his own political radio show, “Occupational Hazards,” on WBAI-FM. “I am Irish, German, and French. But what does that mean? We are 50,000 generations of humans who have survived through every kind of disaster. Shouldn’t that inherently unite us?” he said. His freckled upper arms moved wildly as he twisted the balloons into a myriad of shapes. He switches his tone. In a singsong voice, he recites the types of balloons that he can make. Murdock grew up in a quiet, “uniform,” neighborhood in Middletown, New Jersey. His mother worked in the health sector and his father was a lawyer. As a child he dreamed of becoming an Olympic runner and a stand-up comedian. But he was an awfully shy boy. It wasn’t until he started making balloons that he overcame his shyness. He enjoyed it. “But a man can only make so many poodle balloons before he goes a little funny in the head,” he said. He began to make more elaborate balloons. Murdock started his career making creative balloons at Yankee Stadium, where he worked for many years, before going on to Tavern on the Green. “I follow the economy,” he said. He makes life-size balloon “sculptures” of people. He makes balloons for children’s parties. A decade ago, the Whitney Museum commissioned him to make a balloon version of a piece of tapestry. The tapestry balloons took 33 nights to make. Then, just before it was shown, some relative’s children came to his house and accidentally popped it. He has “earth-friendly” business cards, which consist of a piece of cardboard with his contact information on it and he asks you to take a photo of it or write it down. Murdock has been making balloons for a living for the last 15 years, and over that time, he has encountered quite a few interesting people. And what he has learned from that is that people are almost never quite the way they appear. Murdock himself is emblematic of that idea, for he is a balloon man who aims to serve as a voice of reason.